Having talking parrots as pets go way back to at least the time of Ancient Greeks. By the time of the Roman Empire, it was even more common and courses were given to teach people how to get their birds to mimic human speech. The material covered in this article is much more effective than those courses of ancient times and the training myths of ancient times have been omitted. One of the craziest myths was that the parrot should be placed in a completely dark room during training. One day a man went to an auction. While there, he bid on an exotic parrot. He really wanted this bird, so he got caught up in the bidding. He kept on bidding but kept getting outbid, so he bid higher and higher and higher. Finally, after he bid way more than he intended, he won the bid - the fine bird was finally his! As he was paying for the parrot, he said to the Auctioneer, "I sure hope this parrot can talk. I would hate to have paid this much for it, only to find out that he can't talk!" "Don't worry", said the Auctioneer, "He can talk. Who do you think kept bidding against you?" If you're interested in having a talking bird, this introductory article is for you. This article will cover which birds are good "talkers" and will cover some techniques for encouraging your bird to be a "talker". Whether parrots mimic or communicate using human speech has been fodder for debate for a long time. The Alex Studies by Dr. Pepperberg goes into great detail regarding this subject. Alex is a Congo African Grey Parrot that Dr. Pepperberg studied extensively. Some consider her studies, training techniques, and discoveries the foundation of modern avian cognitive understanding. If you are interested in the cognitive abilities of parrots and their "speech" capabilities, I recommend that you read her book. Though technical at times, I'm sure that you will find it a fascinating book. 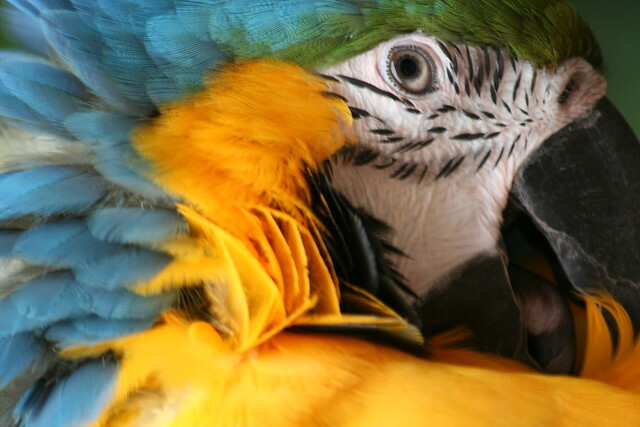 If you ever find yourself looking at your parrot and wondering what it is thinking or how much it understands then check out the links at the end of this article to her book. Let's start with some ground rules for this article and a quick disclaimer. The terms used in this article may not be universally accepted. The terms that I use in this article are defined just to delineate the different categories of "Talking". The word "Talking" has several meanings and depending on your level of technicality it also has several different implications. In my opinion, there are three basic categories of "talking". The first and lowest level is "Mimicking". This is simply the echoing of a word. In this case, the parrot doesn't associate the word with any object or action. A common example is when a parrot vocalizes "pretty bird". Unless it's a really vain parrot or there's another pretty bird in the area than the parrot, in this case, is just vocalizing something that it has heard. The term "talking" in this article usually refers to mimicking but may also refer to "Speaking" or "Communicating" as defined below. The second category of "talking" is "Speaking". For the purposes of this article, it means interacting appropriately with human speech. An example would be the parrot responding with its name when it is prompted with the question "What is your name?" At first glance, this appears to be communication and it may be but it doesn't prove communication. The parrot may have simply been conditioned to respond with its name when it hears this question. The parrot's responsive behavior suggests a higher level of "speech" beyond simply mimicking. Since it is responding appropriately and not just mimicking, it is referred to as "speaking" in this article. This is much harder to teach than mimicking. One technique to teach "speaking" is to form the question using a boring tone and then provide the response in a more interesting tone. For example, you may say "How are you doing today?" in a quiet calm tone than say "SUPER DUPER HOW ARE YOU?" in a louder more interesting tone. The parrot is more likely to begin saying "SUPER DUPER HOW ARE YOU?" in response to your question "How are you doing today"" just because it is more appealing. This is at least "mimicking" and maybe "speaking" depending on who you ask. The third category is "Communicating". In this case, the parrot actually has an understanding of its vocalizations. This is sometimes referred to as cognitive speech. An example of this would be to show the parrot a red key that it has never seen before and ask the parrot "What color is this?" If the parrot responds with "red" then it is communicating. There is a subtle difference between "Speaking" and "Communicating". For example, if the parrot is conditioned to say "red" when you show it a particular red key then it doesn't necessarily have an understanding of red. It may just be conditioned to respond with "red" when it sees that particular object. Whereas, "communication" uses an unknown object so the parrots could not have been conditioned to respond with a particular word when presented with the object. As mentioned before, The Alex Studies by Dr. Pepperberg is an excellent source of information on this topic. You can find a link at the end of this article to her book. So what birds talk? As the buyer in the above joke correctly suggests, not all parrots talk. This is true of different species and different birds within a species. For example, African Grey Parrots are known to be excellent talkers but that doesn't mean that all African Grey Parrots will talk. Hopefully, your only reason for purchasing a parrot is not because it can talk. Parrots have so much more to offer than talking and you would be cheating yourself and your parrot if that is your only reason for getting a parrot. Talking should be considered a bonus and not a requirement. However, if "talking" is important, the only way to make sure that you are getting a parrot that will talk is to purchase a parrot that already talks. Having said that, there are certain species that are known to be more inclined to be good talkers. Here is a list of some parrot most likely to "talk" with the better-known groups in parenthesis. As mentioned previously, not all birds in the list will talk and not all birds that talk are on this list. The order of the list is a good approximation from best talkers (African Grey) down to not-the-best talkers. This list isn't perfect and is just a basic guide with no guarantees. For example, there are some Cockatiels that talk better than some African Greys. So you have a parrot that is capable of talking and you want to teach it to talk. This section will cover three basic techniques. These three techniques are Audio Recordings, Parent-Parrot teaching, and Modeling. The first two methods use useful for teaching your parrot to mimic. The second and third methods can be useful for teaching your parrot to "speak". And finally, the third method is most useful for teaching your parrot to communicate. The first technique is Audio Recordings. This may be an Audio CD or tape that you purchase or create that is capable of looping over and over. You can purchase these on the Internet or create them yourself with your home computer. Most people use this method for long periods of time when the parrot is alone. But does this technique work? The jury is still out on this one. Some people with some parrots have had some success with this method while others have not had success with this method. It is certainly not the best method to use but in some cases, it can be effective. This is probably the most common technique used to teach the classic Andy Griffin Theme Song. However, the same thing played over and over will quickly become very boring. Parrots just like people will eventually tune out the boring stuff in their environment. For this reason, it is recommended that you keep the sessions short. Sessions should be about fifteen-minute sessions 2 or 3 times a day. This technique is used to teach "mimicking" as defined earlier. This is a cheap and easy way to teach your parrot to mimic. As with most things in life that are cheap and easy don't be surprised if it doesn't work. The second technique is Parent-Parrot teaching. This is where you talk to your parrot. This method is effective because it provides your parrot with a very important need. That need is to bond with its "flock" and to communicate with it's "flock". In most cases, you'll find that the more you talk and communicate with your parrot, the more it will respond and talk back. Most parrots are very social and thrive on this kind of attention. This method will never get boring to your parrot and can be fun for you and your parrot. If properly rewarded for talking, your bird will happily talk and talk and talk. You should talk to your parrot while feeding, cleaning, doing dishes, preparing meals, watching TV, walking through the house, etc, etc, etc. You can maximize this method by using your speech in context. If you're putting food in the bowl then tell your parrot that you're giving it food. If you're cleaning the cage then tell your parrot that you are cleaning the cage. This method is useful for teaching "mimicking" and "speaking" as defined earlier. Phrases that indicate mimicking are phrases such as "want to peanut?" or "Watcha doing?" In these cases, it is just mimicking things that it has heard you vocalize. This method can also be used to teach communication as defined earlier. In this case, you should use the same word in several different contexts. Examples would be "Do you want this peanut? ", "Here's a peanut", "This is a good peanut", "is that peanut good?" Initially, your parrot will mimic you and use the word out of context much like a child learning to speak. You can take the mimicking to the speaking level by simply correcting the parrot-like you would a child. By doing this, you will eventually teach the parrot to use the word in context. For example, it may begin to vocalize "this is a good peanut" when you give it a peanut. This technique can be used for teaching your parrot "mimicking" and "speaking" as defined earlier. This technique can also be used to a lesser degree to teach "speaking". The third and final technique (Modeling) is more effective for teaching "speaking" and "communication". The third technique is "Modeling". This is the method that Dr. Pepperberg discusses in her book The Alex Studies. This method involves two trainers (usually two humans) and the parrot. Though not practical for most of us, it can be very effective if you have the means to use this technique. The parrot takes turns being the "trainee" with the other human. An example would be to have the Trainer human and the trainee human demonstrate what is required while the parrot watches. For example, the Trainer may ask the trainee "what color is this" while holding up an object. The trainee will respond with "blue" and the trainer will respond with "no, the color is red". The trainer will repeat the question and the trainee will respond with "red" and the trainer will reward the trainee for the correct answer. The reward may be verbal ("good girl") or the reward may be a treat. Then the parrot will assume the role of the trainee while the human trainee watches and the process repeated. This method has been shown to be very effective in teaching birds, other animals, and humans with learning disabilities. This modeling technique was used to teach Alex the Congo African Grey for Dr. Pepperberg's studies. This method is effective at teaching "mimicking", "speaking", and "communication" as defined earlier. As you may guess, the second technique is the most common technique used to teach pet parrots how to talk. This technique is more effective than using Audio Recordings and it only requires one "trainer" compared to the third technique. More importantly, the second technique provides the perfect opportunity for the Parent to bond with the Parrot. This is a win-win technique because bonding is essential to the parrot's well being and it provides a means to teach the parrot to talk. The next section covers some miscellaneous Tips, Do's and Don'ts. Most directly apply to the second technique of Parent-Parrot teaching but also apply to the other techniques. Talk, Talk, Talk to your parrot. Phrase your talk from the parrot's perspective. "Give me a peanut" instead of "Do you want a peanut?" Repeat phrases at appropriate times. For example "I want water" when giving fresh water. Don't say words that you don't want to be repeated. Create verbal cues such as saying "Good Morning" in the morning. Don't teach whistling before teaching talk. For some reason, words with "tt" seem to be favorites such as "pretty" or "kitty". Use the word in different phrases "This is a peanut", "Do you want a peanut", "I like peanuts"
Don't put the parrot in a covered cage during training. This myth goes back to ancient Greek times. If you've ever heard a parrot joke, most likely it involves a talking parrot. The parrot's ability to "talk" has captured our imagination for thousands of years. I'm sure that you will agree (if you own a parrot) that its ability to talk is just one of the many characteristics that make parrots fascinating companions. A lot of people purchase a parrot for their ability to talk but eventually learn that with or without its ability to talk, it is an awesome pet and companion. Hopefully, this introduction to teaching your parrot to talk has been useful. Check out some of the book links below if you're interested in learning more. "The Pleasure of Their Company " by Bonnie Munro Doane and The Alex Studies by Dr. Pepperberg are two good sources to start with. You will be amazed by the Dr. Pepperberg's successes and fascinated with her findings. Though technical at times and not necessarily a required reading for all parrot owners it is a fascinating book.